The Ferry’s second season this year presents permanent possibilities. 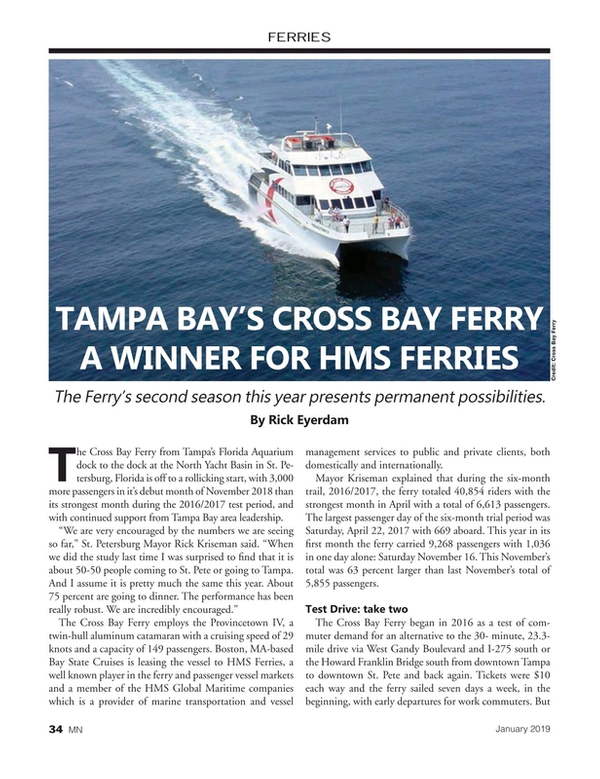 The Cross Bay Ferry from Tampa’s Florida Aquarium dock to the dock at the North Yacht Basin in St. Petersburg, Florida is off to a rollicking start, with 3,000 more passengers in it’s debut month of November 2018 than its strongest month during the 2016/2017 test period, and with continued support from Tampa Bay area leadership. The Cross Bay Ferry employs the Provincetown IV, a twin-hull aluminum catamaran with a cruising speed of 29 knots and a capacity of 149 passengers. Boston, MA-based Bay State Cruises is leasing the vessel to HMS Ferries, a well known player in the ferry and passenger vessel markets and a member of the HMS Global Maritime companies which is a provider of marine transportation and vessel management services to public and private clients, both domestically and internationally. Mayor Kriseman explained that during the six-month trail, 2016/2017, the ferry totaled 40,854 riders with the strongest month in April with a total of 6,613 passengers. The largest passenger day of the six-month trial period was Saturday, April 22, 2017 with 669 aboard. This year in its first month the ferry carried 9,268 passengers with 1,036 in one day alone: Saturday November 16. This November’s total was 63 percent larger than last November’s total of 5,855 passengers. The Cross Bay Ferry began in 2016 as a test of commuter demand for an alternative to the 30- minute, 23.3-mile drive via West Gandy Boulevard and I-275 south or the Howard Franklin Bridge south from downtown Tampa to downtown St. Pete and back again. Tickets were $10 each way and the ferry sailed seven days a week, in the beginning, with early departures for work commuters. But the ridership showed that far fewer commuters were riding than tourists enjoying the 50-minute ride past Harbour Island, Davis Island through Hillsborough Bay, around MacDill Air Force Base, then west across Tampa Bay to St. Pete for dining and entertainment. The ferry follows the same course and runs November through April between the Florida Aquarium, 701 Channelside Drive, Tampa, and the dock in the North Yacht Basin at 418 Bayshore Drive N.E., between the Vinoy Renaissance St. Petersburg Resort and the St. Petersburg History Museum. The fare was lowered from $10 to $8; with children age 5 to 18 paying $3 and children under 5 ride free. Discounts are available for seniors, members of the military and veterans. Passengers can purchase snacks and beverages, including beer and wine, from an on-board cafe. This year, the Monday departure and early departures were dropped in favor of a more tourists friendly Tuesday through Sunday schedule with new, late-evening runs and four round trips on Fridays and Saturdays. Mayor Kriseman said the schedule could be modified for special events. “We will continue to look at the times the ferry is operating at the most effective and efficient time, that we get the greatest ridership and provide the greatest service. And if we need to tweak that, we certainly will,” he said. For the test period, two years ago, each of the four governmental entities – the cities of Tampa and St. Pete and the Hillsborough and Pinellas County commissions – each put in $350,00 and each got back about $44,000 at the end of the six month period. “This year we each put in $150,000 each. And so my hope is, if the numbers continue, we will get something back. But certainly our subsidy numbers have gone down significantly,” Kriseman said. “The interesting thing is that last time the total investment from the four government entities was about $1.4 million,” Kriseman added. “What we have learned from the data is that the numbers spent in our two communities totaled about $1.6 million. So there was more of an economic benefit in our two communities in dollars spent than what it cost us. Already in the works is a Hillsborough County public-private partnership to provide commuter ferry service to the sprawling MacDill Air Force Base (MAFB), located at the tip of a peninsula in south Tampa. Home to both the U.S. Central Command and Special Operations command, the base employs over 16,000 civilian and military personnel, nearly half of whom live in southern Hillsborough County. Because of the geography of Tampa Bay, these southern Hillsborough County residents have a daily roundtrip commute of 70 miles on average, which can take over an hour each way, most of it on roadways at capacity. HMS and the Akerman LLP law firm with Ed Turanchick in the lead conducted a study that documented that the MacDill commuter ferry service would reduce average daily travel time by over 20 minutes each day, and save MAFB employees approximately $2,600 annually. Projected community and environmental benefits would also be significant, with the first phase of the project reducing travel on area roadways by over 90,000 miles each day. The net reduction in vehicular use also would reduce nitrogen oxide emissions in the Tampa Bay area by 23 tons annually and vehicular greenhouse gas emissions by 8,800 tons annually. “The Cross Bay Ferry will really be great first step to providing full ferry service, with the hope being to develop it and be successful. Then (the MacDill) commuter service could also come to St. Pete and Tampa, connecting downtown Tampa and St, Pete and with the south shore,” Kriseman said. Hillsborough County applied for a federal ferry grant, through the Hillsborough County Area Regional Transit Authority, and was awarded $4.87 million in August 2014. This was the second largest project-specific ferry grant awarded by the federal government in 2014. With this positive news, however, came new federal regulatory mandates under the National Environmental Policy Act of 1970, which required Hillsborough County to undertake a review of alternative ferry terminal locations. This review is now underway. For the greater Tampa Bay area, the prospect of permanent waterborne transit options promises many long term benefits. That effort comes with a lot of moving parts, but local leadership is the key. What comes next could be truly exciting. This article first appeared in the January 2019 print edition of MarineNews.